On a cold rainy winters night, there is nothing better than snuggling up in front of a nice warm gas fireplace in Sydney. The warmth of a fireplace is amazing – from the scent of burning wood from an inbuilt wood fireplace in Sydney to a gas fireplace. Fireplaces make any room a gathering spot, with lots of families enjoying lounging around the fireplace, watching TV, a movie or catching up and talking about how their day has been. A fireplace in a bedroom is a relaxing place to be, whether you’re curled up in bed with a good book, watching TV or just chilling out with a glass of wine. Most new home designs have at least one fireplace incorporated into their design. Homeowners and home designers are seeing the trend toward home heating in both wood and gas form. Fireplaces are being installed not only in family or lounge rooms but also in dining rooms, kitchen spaces, out door living areas and in master bedrooms. When choosing a fireplace, you will find there are a lot of designs to choose from, but no matter what style you have in mind, there will be a fireplace that suits you, your room and budget perfectly. There are many things to consider when picking out your fireplace, and some things may limit your choices, but never let that put you off. 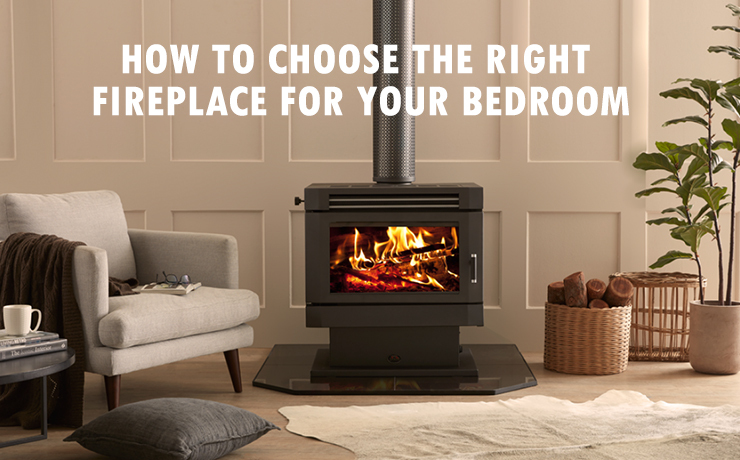 You need to consider a fireplace that comes in a heating format you like and one that will look *at home* in your bedroom. You’ll need to decide which type of fireplace is right for you? Are you looking for a fireplace that will be a source of heat for the room, or are you looking for a fireplace to *decorate* your room, something that will not only look good but become a feature of the room? Which kind of fuel do you prefer – gas or wood? How much work do you want to put into maintenance? Cleaning etc… The answer to these questions will help you determine if you are better suited to a gas fireplace, or a wood burning fireplace. Today there has been a strong trend towards gas fireplaces simply because they can be a lot more affordable to build and install than wood-burning fireplaces that will also need a chimney. There are some pre-fabricated style fireplaces that have taken over simply because of their cost. One of the biggest drawcards when it comes to choosing the right fireplace for your bedroom is a gas fireplace. They provide both a radiant heat and a flame all without the inconvenience of wood. If your master bedroom is on the second floor, gas fireplaces are perfect as you don’t have to lug wood upstairs. Gas fireplaces also come in a range of sizes and design choices, and when it comes to venting, you get more leeway with a gas fireplace as opposed to a wood burning fireplace. If choosing a gas fireplace, look for one with the highest efficiency rating. If you decide a wood burning fireplace is right for you, then the construction materials will be important. Brick fireplace designs are the most common design for a fireplace, simply as brick won’t show any signs of staining from the smoke. Stone is also a popular choice when choosing a fireplace design – stones can include Limestone, marble, slate or even ceramic tiles. If you have already chosen a design theme for your bedroom – especially if you are building a new home, look for a fireplace that will compliment your room, accents such as tile, brick or wood can look good in any room. If you are also choosing a mantle it’s a great way to match it to the décor of your bedroom, you can finish the mantle *off* with some decorative touches such as flowers, artwork, mirrors or statues, whatever will compliment the theme of your bedroom the best.